Ron has a passion for sharing his knowledge and educating when it comes to curly hair, as well as a great vision! Once again, Ron will be traveling to Brazil and Cuba to continue his teaching journey. In November, Ron will be in Brazil for a week teaching cutting techniques. 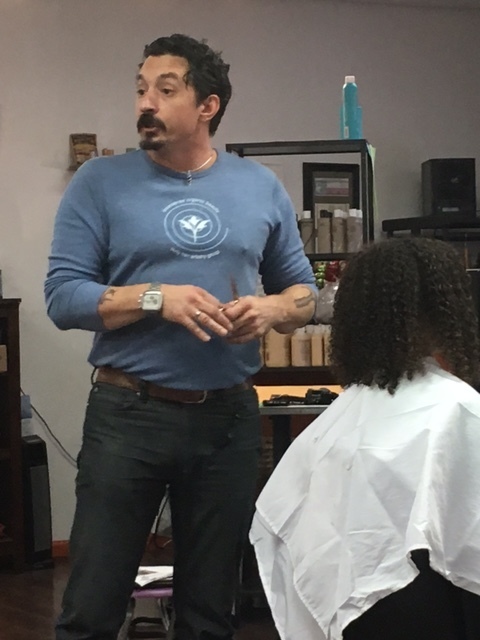 In April, 2019, Ron will be leading a team of stylists to Cuba, where the group will volunteer their time teaching all facets of hair cutting, styling and color. In the past Ron has volunteered his time teaching at the Capital Region Boces. We’re excited to announce he is returning to Boces once again to continue educating. In addition, in November, Moisture Salon will be collaborating with the Capital District Educational Opportunity Center College, EOC in Troy, NY, where he will be teaching. Hi Curlies! I'd love to talk to you about the importance of at home care and salon care. Certain times of the year (mostly winter and fall) our hair gets brittle and sometimes limp and we try new products and nothing seems to work! When going silver your hair can appear frizzier and need more treatments as well. I'm here to teach you about hair treatments… there's a few we do here at the salon. We offer these services to existing clients because we like to see how your hair responds to the hydration after your first appointment. Number one is our Deep Moisture Treatment that is right for your specific hair type. We have you sit under the steamer to open up the your hair follicle so that the treatment penetrates into your hair giving your curls that extra hydration it needs during these months. Some clients need this treatment throughout the year, depending on hair type. Our other hair treatment we do here is called Olaplex. Many times you see stylist's advertising Olaplex treatments with your color service, which is great! We offer a stand alone treatment for some curls who have had highlights, past heat damage and chemical damage to the hair. This treatment rebuilds the bonds of the hair and re-strengthens. This helps your hair from breakage and allows the hair to grow longer and stronger! Some of the feedback we have gotten from clients is they have noticed their hair has become shinier, smoother and more manageable curls after receiving a treatment. The stylist will recommend a treatment for your specific curl & hair type to maintain at home. We usually do not make any treatment recommendations until after your initial consult as to give your hair time to gain moisture. So if needed this can be discussed with your stylist after your first appointment. Thank you for reading this blog, I appreciate everyone taking the time to read the knowledge I have adapted! I was so honored and pleased to be part of the Girls Inc. Breakfast Panel that was hosted at Union College. it was an amazing event. The topic was all about Girls and their inner beauty and the conversation just happened to be focused on Curls and lot of them to be exact. Everyone on the discussion panel spoke about appearances and how being natural was the fight they had their entire life.. not anymore.. They have learned to embrace the curls and now know how to love them and not hate them.. Girls Inc is a wonderful organization to be involved with. This summer we will be mentoring a young adult at the salon. So I will keep ya posted on how things go. Well off to start my curly day.